Along with Star Wars, Star Trek has got to be the source of more fan films and webseries than pretty much anything else. Some of them are purely amateur efforts, and others, such as Star Trek: Phase II, have enlisted talent from the Original Series itself — in Phase II’s case, actors Walter Koenig and George Takei, and writers David Gerrold and D.C. Fontana, among others. Now an ambitious new Trek webseries has turned to Kickstarter…and has already met its goal of raising $100,000 with a week yet to go. 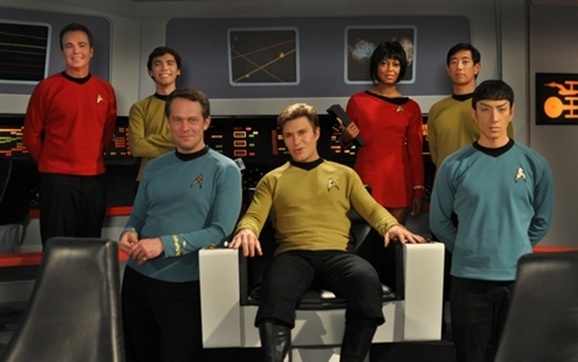 Star Trek Continues seeks to…well, to continue Star Trek. Specifically to pick up where Trek’s third and final season left off and to complete the “five-year mission” as it might have played out had the series not been canceled. They already completed and released their first episode, “Pilgrim of Eternity,” last May, and you can watch it below. Now their Kickstarter goal is intended to allow them to shoot three more episodes. They’ve got some decent-looking sets (“Production values!”) and they’ve even got actor Michael Forest reprising his role as Apollo from the Original Series episode “Who Mourns for Adonais?” Even though they’re already five grand over their goal, you can still pledge and get some goodies for your trouble. A mere ten bucks will get you a PDF of the “Pilgrim of Eternity” script and a thank-you on their website. $100 or more will get you a week-early preview of the next episode. If you’ve got serious deep pockets and don’t mind parting with ten grand, you can take home the screen-used Enterprise conference room. Or you could buy a new one way cheaper and just tell everybody it’s from the Enterprise. LURK hasn’t hit its goal of raising just shy of ten grand yet, but there’s still 22 days to go, so you Whedon fans out there have plenty of time to do some soul searching to decide if you want to open your wallet for the project. Fray is sort of the little-known stepchild of Whedon’s various fictional universes, but it’s one I’m always keen to see more of. 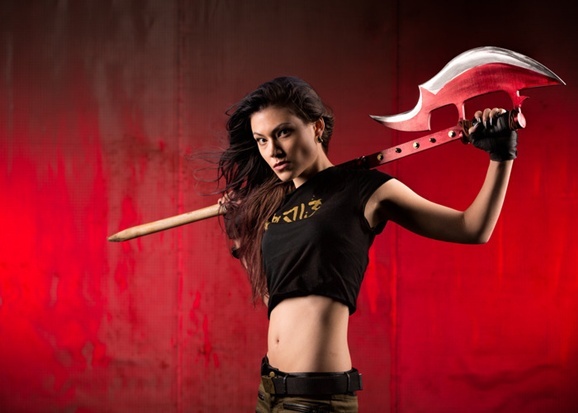 They’ve already got a very snazzy replica of the Scythe, Melaka’s signature weapon (which also appeared in the latter seasons of Buffy) and actress Stefanie Woodburn looks great as Melaka. This is one I’m actually going to pledge to myself, but here are a few of the pledge rewards you can get. For $25 you’ll get a digital download of the short plus a thank-you in the credits. $100 or more gets you a crew t-shirt, the credits thank-you, digital downloads, and an invite to the premiere and after party in Los Angeles. If you’re feeling especially generous and pledge $5,000 or more, you’ll get an executive producer credit, a photoshoot, goodies from all the lower tiers, and they’ll let you keep the scythe. How cool is that?